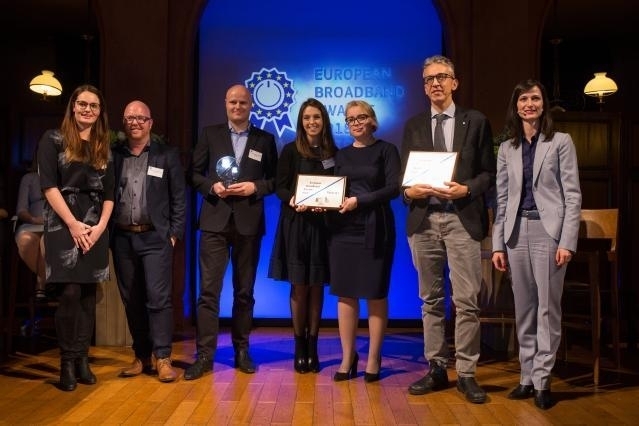 The winners of the European Broadband Awards 2018 were announced at the special Award Ceremony on 19 November in Brussels. The European Commissioner for Digital Economy and Society Mariya Gabriel and the Commissioner for Regional Development Corina Creţu awarded 5 project winners in different categories focusing on innovative models of financing, cost reduction, territorial cohesion, socio-economic impact and competition. The winners also had the chance to present their projects at the Broadband Day: Mind the Broadband Gap Conference on 20 November. The project is a great example of installing a gigabit up- and download FTTP network. With start-up capital provided by the local community, a sustainable high-speed network was built to service all residents. The profits generated by the broadband services are reinvested back into the services and infrastructure, or in further community-level projects, identified by the shareholders of the community interest company. In this project of a Swedish municipality, the old copper network was replaced with fibre and mobile networks. Thanks to the successful collaboration of the municipality with the internet provider Telia, at the end of the project in January 2019, all residents will benefit from a modern communication infrastructure with download speeds up to 1 Gb/s. Besides the infrastructure, the municipality and internet service provider Telia launched an educational initiative “More Digital”, as a key part of helping seniors take their first steps to become digitally literate. This project covers the whole Poland, especially remote areas and those who do not have broadband at all. The project provides new opportunities for work, communication, education and culture for citizens living in remote regions. This will benefit the schools in these remote areas which will be connected to the high-speed telecommunication services. It is an outstanding example of how EU funds can make a real difference to the lives of citizens. The project provides a high-speed broadband network, which benefits inhabitants of a very small island (110 houses) located in the UNESCO world heritage area in Denmark, Wadden Sea. The local community gathered a big interest in broadband penetration from the residents of the island. Together with the utility provider SE/STOFA, the community managed to connect almost all houses on the island to the network. As a result, the tourist industry now enjoys much better conditions for servicing visitors (e.g. online booking systems). This is accompanied by increased economic activities (e.g. island tours) on Mandø. The French Val d’Oise Ultra- Fast Broadband project, based on public funding, ensures that all housing, businesses and public sites in the Val d’Oise department have access to ultra-fast broadband services. Wholesale services are provided on a neutral basis by two public initiative networks (PINs), Debitex and Vortex, which allow all ISPs to make their offers available for the region. It has a great social impact, as it directly contributes to eradicating the digital divide in this French department by allowing to those living in rural areas access the ultrafast broadband. In addition, this access is at lower costs than they would get without this public initiative. The next day, the Broadband Day: Mind the Broadband Gap Conference took place and offered a unique opportunity for the winner projects to share their experience beyond borders. All conference participants had the chance to network with the representatives of the projects highlighted as best practices in Europe. Participants took an active part in the discussions of the main actors involved in regulation, financing and broadband deployment across Europe. In 2018 and 2019, the projects will be featured on DG CONNECT webpages, in newsletters and will be displayed in the good practice database of Broadband Europe. atene KOM GmbH facilitates the awards, organises the process and supports the EU Commission as well as applicants in all stages. Photo: Mariya Gabriel (European Commissioner for Digital Economy and Society, r.) und Magdalena Jähler (atene KOM, l.) with the winners of the European Broadband Awards 2018. Brussels, 19 November 2018.